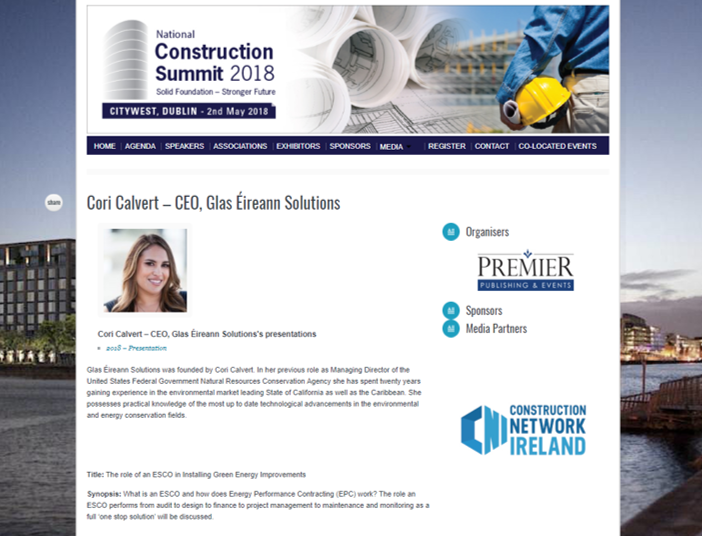 Glas Eireann Solutions CEO, Cori Calvert, will give a talk on the role of an ESCO (Energy Services Company) in installing green energy improvements at the National Construction Summit 2018. This year’s National Construction Summit will be held on 2nd May 2018 at Citywest, Dublin. The National Construction Summit brings together over 2000 construction companies, developers, policy makers, building owners, government, lenders, architects, planners, facility managers, property managers, building material providers, energy and environment professionals to stimulate debate, enrich knowledge and connect stakeholders. Key themes for the 2018 summit will be Brexit, Foreign Direct Investment, Infrastructural Investment, Building Materials Innovation, Energy & Sustainability. During her speech, Cori will outline the role an ESCO performs in green energy improvements from audit and design to finance, project management, monitoring and maintenance. Cori will also outline how Energy Performance Contracts (EPC) work and how clients can benefit by sharing savings to repay initial outlay. To see Cori speak and to attend the National Construction Summit 2018 you can register here for free.